AISTech Round Up! | AISTech Round Up! 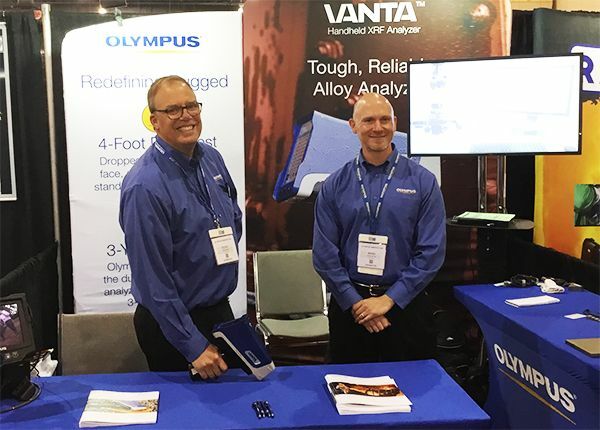 Our X-ray fluorescence (XRF) team recently presented at the Association for Iron and Steel Technology (AISTech) Conference in Philadelphia, Pennsylvania, USA in May 2018. Learn more about these presentations where we discuss recent advancements in XRF for the iron and steel industries. The team in the Olympus booth on the expo floor at AISTech. Handheld X-ray fluorescence (HHXRF) provides information regarding a variety of alloy process controls, including full alloying element identification. Intermetallic compound forming elements, such as silicon, phosphorus, and sulfur levels, are also accurately resolved. Auto-ranging chemistry results, used in conjunction with a large grade library, enable a user near-instant verification of both process inputs and outputs. Now, an HHXRF operator can, with a single instrument, verify incoming material composition, use the instrument to confirm the alloy content of produced material, and segregate machining chips or other metallic scrap. HHXRF now produces reliable compositional results rivaling aspects of laboratory-grade XRF while maintaining portability. Process-based, in-line X-ray fluorescence (XRF) for alloy composition analysis is a fast and accurate way to help ensure that chemistry specifications are met. A rugged, stationary XRF instrument enables 100% testing of long products. Rapid test times help ensure desired process throughput. Auto-ranging chemistry results, used in conjunction with a large factory grade library and user-defined pass/fail criteria, provide consistent verification of process materials. The thickness of galvanic coatings is currently monitored using a number of nondestructive and destructive methods. Monitoring galvanic coatings on steels to verify that they meet critical specifications is important for customer acceptance, but may not account for zinc used by the producer. Using handheld X-ray fluorescence (HHXRF) to determine the thickness of a galvanic coating is now possible. By using relevant material adsorption calculations, zinc thicknesses can be reported quickly, accurately, and, in some cases, more precisely than magnetic methods. The speed and nondestructive nature of HHXRF provide clear advantages over destructive optical methods. Michelle has more than 9 years experience in marketing communications and works in Olympus' Analytical Instruments business to promote X-ray fluorescence and X-ray diffraction analyzers. She works with product, engineering, and applications groups for new product launches, to create webinars, and to write application notes.